...."But it ain't about how hard ya hit. It's about how hard you can get hit and keep moving forward. How much you can take and keep moving forward. That's how winning is done!" to be a mother and to inspire and impact others...this letter reminds me that I live those dreams every single day! Thank you Susi!! My name is Susi (short for Susanne), I am a proud mother of two little boys, 1 and 2 years old. I am 31 years of age!! We once had a very brief email conversation - I believe that was when I was pregnant with the first one. A good friend of mine whom you know as well - Gerhard - showed me your website. Prior to my two pregnancies I was training very intensively, I am from a tracks and field's background and have found my love and passion for fitness and bodybuilding a couple of years ago. I was just about to embark on the - long and hard!!! :-) - journey of giving competing a try when I got pregnant for the first time. 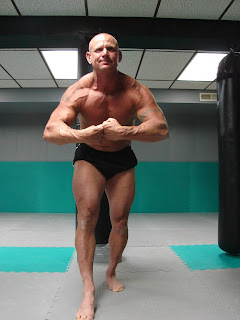 Things did not always go smoothly and I forgot about many important things in life - including you and bodybuilding. But while cleaning up my mailbox a couple of weeks ago I stumbled across your name, looked at your website - WOW!!! It hit me like a hammer!!! I WANT THIS AS WELL!!! AND IF I WANT IT BADLY ENOUGH I CAN DO IT!!!!! I am sure you don't even realize how much of an inspiration, of a motivation you are for someone who has just given birth twice as well, who was - and actually still is- totally out of shape and is sometimes close to feeling very depressed about it!!! But through your dedication, your love and passion for the sport, your drive and willpower I have come to realize what can be achieved!! Whenever I look at your pics they literally make me scream "I want to look this way as well!!" They - and therefore you - have since given me training and in many ways my life a totally new sense of direction and somehow have helped me to rediscover myself!!! Even if I cannot be physically a member of Team Abrams - I am one by heart!!! THANK YOU FOR THIS - THANK YOU FOR BEING JENNIFER ABRAMS!!!!! I showed my husband your page - and could tell he was very impressed!!!! God bless you, Jennifer Abrams!! You are a wonderful and ever so inspirational person!!! Many new posts on my training methods this year and a new Q&A post in my members journal!